The powerful STIHL high pressure cleaners clean up dirt in no time. Robust technology and comfortable equipment makes cleaning almost a pleasure. For the industrial company or around the house: from the handy compact device up to the professional model STIHL has a machine for every need. And in the STIHL accessories range, you will be able to find a solution for unusual cleaning tasks too. 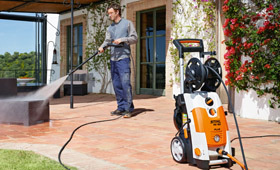 All STIHL high pressure cleaners come with a 3 year guarantee.